This is the quick notes in written form of our podcast on February Slumps! If you’d like to listen to the full talk, please find us in your podcast app! First things first… don’t use papyrus or comic sans font. Hahaha! You have to listen to the podcast for more on that. Get an InstaPot. It seriously is worth all of the hype. It is a legit pressure cooker that saves so much time. Get Dollar Store clear plastic bins. Gather all the dry ingredients for dinner and label it “Monday”. So on Monday, you can grab the bin and know all the ingredients are right there. Also, the kids know that what is in the plastic bins are, without a doubt, not for snacking! Prep all fruits and veggies on Sunday night. Meghan dices and chops all veggies and puts them into Ziplock baggies. She can pull them out quickly on that night’s dinner, ready to be thrown into the InstaPot! Do a themed day meal: Taco Tuesdays, Spaghetti Saturdays, Meatless Mondays. This narrows the “what should we eat?” questions. Plus, kids love routine, especially if it’s a favorite meal, they don’t mind eating it every week. Stick to the grocery list and stick to your budget. It eliminates extra decisions made if you try to wiggle where there is no room. Keep it simple! Go shopping less but buying both fresh and frozen fruits and veggies. 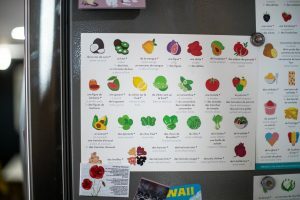 We eat through fresh produce first and then towards the end of the grocery shopping weeks we will eat meals using the frozen produce. This will allow going grocery shopping less often and still get proper foods. If you are new to meal planning, start with just one day a week of meal planning. Then work up to multiple days a week of meal plans. Start small and build on it over time so you don’t get overwhelmed. It’s easy to get overwhelmed or waste food if you go all out the first time meal planning. Start small and work from there.